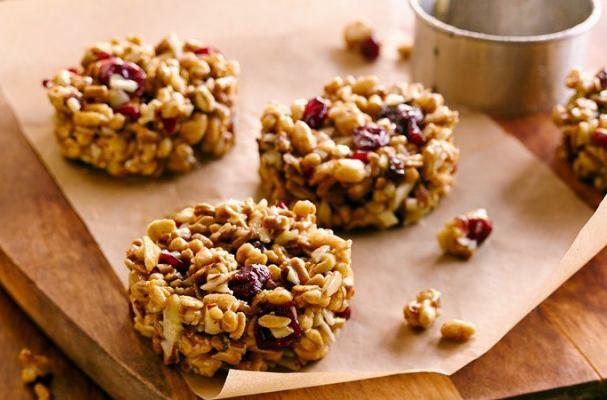 These protein packed cereal cookies are a no bake breakfast. A protein packed cereal, such as Fiber One Protein Cranberry Almond, is combined with melted butter, brown sugar and honey and then spooned into round molds. These are an easy breakfast to take on the go or a healthy afternoon snack. In 2-quart saucepan, melt butter over medium heat. Add brown sugar and honey; stir until well combined. Cook over medium heat 2 to 3 minutes or until sugar is dissolved. Remove from heat. Add cereal, cranberries and almonds; fold in to coat evenly. Line large cookie sheet with cooking parchment paper. Place 2 1/2-inch round biscuit cutter on cookie sheet. Spoon 3 rounded tablespoonfuls cereal mixture in center of cookie cutter; press firmly. Remove cutter. Repeat with remaining cereal mixture. Refrigerate 15 minutes or until set.